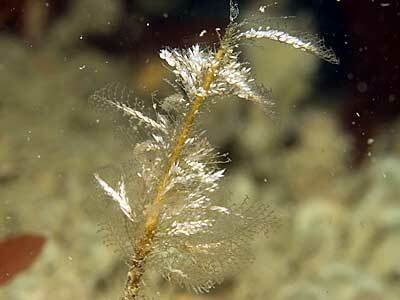 Description: A feather-like hydroid with central main stem and numerous side branches arising in a flat plane. The main stem is brown in colour. The side branches are composed of separate joints, one joint bearing a hydrotheca and defensive nematothecae alternates with a shorter joint bearing only nematophores. The gonothecae are amphora-shaped, with an oval body and tubular neck, borne along the central region of the colony. 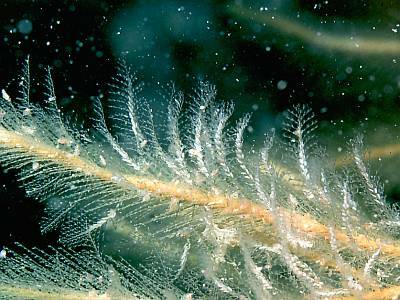 This species seems to come in two forms, when growing on other hydroids it measures only about 15mm in height, while on rocky substrata it grows to 70mm or more in length. Habitat: The dwarf form of this species is found most commonly on Nemertesia ramosa but also on other hydroids. The larger form is found mostly in strong to very strong tidal streams attached to bedrock or boulders. Distribution: Widespread and common throughout the British Isles. Similar Species: This species is similar to Kirchenpaueria similis but can be distinguished by its amphora-shaped gonothecae and brown as opposed to colourless main stem. Picton, B.E. & Morrow, C.C. (2016). Plumularia setacea (Linnaeus, 1758). [In] Encyclopedia of Marine Life of Britain and Ireland.